With the recent hail storms that blew through the Rockwall Texas area, you may not realize that you have damage. In this video Paul Mason, owner of Mason Roofing, will describe what to look for if you think you may have hail damage. We have had clients all over the Rockwall area that find out they have hail damage not because they had their insurance company adjuster come out, but from needing to sell their house. When the inspector comes out to look over the house before purchase, they find the hail damage. If you think you might have damage, give us a call and we can come out and do a free inspection to see if you do have damage. 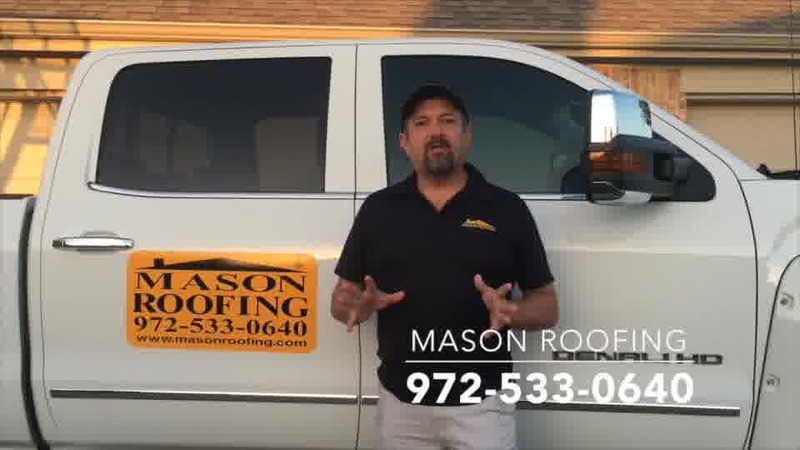 We will get up on your roof, see if there is any damage and take pictures to show you. We will also inspect the outside of your house for any collateral damage done by the storm. Once we determine if there is any damage, at that time you will call your insurance company to report the damage. They will have an adjuster come out and assess the damage. We will be glad to come out and meet the adjuster to help point out anything that could be missed. More often than not, they will find just about everything. Once the adjuster is done, they will give you a scope of work report that will let you know what they will pay to have done. At this point, we will take it from there. We can handle just about everything that can be damaged from the storm for you. In this way, you don’t have to worry about searching and finding multiple contractors to handle each trade that has to be done to your house.